Boarding your horse at Spring Run provides a safe and comfortable environment for your horse and peace of mind for you. Our barn is professionally run by our barn manager, Susan Rockhold, who makes sure that all of our horses are happy and healthy. We take the time to get to know your horse and his daily habits. We will notice if he isn't finishing all of his grain, seems a little chilly and needs an extra blanket, or loses a shoe in the field. We have a barn directory with each horse's owner, vet, and farrier information so you will be contacted immediately and your horse gets the treatment he needs. Your horse's turnout is based on his/her needs. We all know that horses are not all the same - some prefer all day or all night turnout while others enjoy only three to four hours. At Spring Run we give your horse the amount of turnout he/she needs. All horses are turned out in small groups and for those few horses that need their own space, private turnout is available. We also have several private limestone pens that are great for horses that are recovering from an injury or just need some extra time. We work hard to properly maintain the fields, rings, and barns. We fertilize all of the fields every year, routinely water and drag the rings. 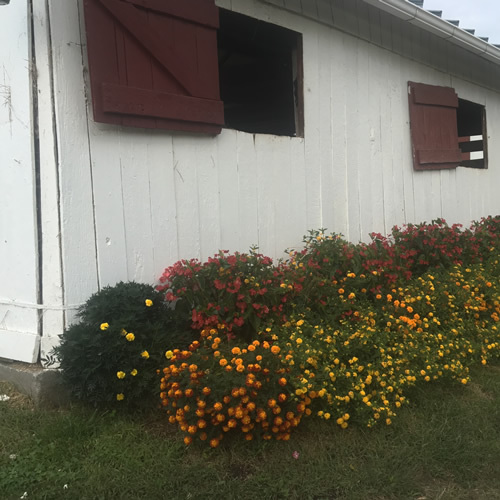 We take pride in keeping our barns and grounds in neat and organized condition providing an enjoyable atmosphere. We provide excellent horsemanship with safety always being our top priority. From properly leading horses with a halter and lead, feeding hay before graining, bringing a galloping horse in from the field, to having all of our horses on a worming and vaccination program, the safety and wellbeing of your horse always is our top priority. Our boarding rate is $450 for outside board and $675 per month for stall board. Please note that a minimum of one lesson per week is required by all boarders. Please contact Susan Harris at 502-643-2364 to discuss your horse's boarding needs and to schedule a time to come and visit us.